The CMD News Column of the January -February 2013 issue of the IA Magazine contains some photographs from our SBC. Here are some photos taken during our last lecture by Dr. Kiartzis. You can also find Dr. Kiartzis presentation in the link below. 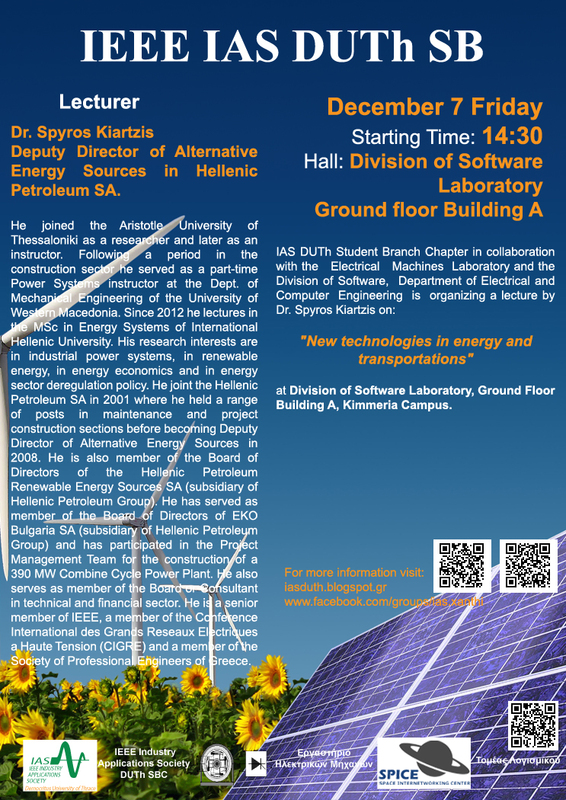 "New technologies in energy and transportations"
Where: Division of Software Laboratory, Ground Floor Building A, Kimmeria Campus. Spyros Kiartzis is Deputy Director of Alternative Energy Sources in Hellenic Petroleum SA. Haw received his Diploma and Ph.D. in Electrical and Computer Engineering from the School of Engineering and his degree on Economics from the School of Law and Economics both from the Aristotle University of Thessaloniki. Upon graduation, he joined the Aristotle University of Thessaloniki as a researcher and later as an instructor. Following a period in the construction sector he served as a part-time Power Systems instructor at the Dept. of Mechanical Engineering of the University of Western Macedonia. 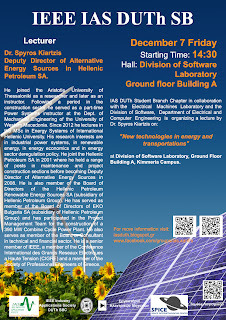 Since 2012 he lectures in the MSc in Energy Systems of International Hellenic University. His research interests are in industrial power systems, in renewable energy, in energy economics and in energy sector deregulation policy. He joint the Hellenic Petroleum SA in 2001 where he held a range of posts in maintenance and project construction sections before becoming Deputy Director of Alternative Energy Sources in 2008. He is also member of the Board of Directors of the Hellenic Petroleum Renewable Energy Sources SA (subsidiary of Hellenic Petroleum Group). He has served as member of the Board of Directors of EKO Bulgaria SA (subsidiary of Hellenic Petroleum Group) and has participated in the Project Management Team for the construction of a 390 MW Combine Cycle Power Plant. He also serves as member of the Board or Consultant in technical and financial sector. He is a senior member of IEEE, a member of the Conference International des Grands Reseaux Electriques a Haute Tension (CIGRE) and a member of the Society of Professional Engineers of Greece. Here are some photos taken during our last lecture by Dr. Georgiadis. You can also find Dr. Georgiadis presentation in the link below.